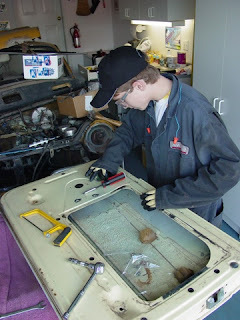 Our nephew Brendan came down again to help us with a little auto-restoration fun. I'd been saving the tear-down of the passenger door for him, and since we're in sort of a holding pattern on the undercoating, we finally got back to the engine. I'd hit a road block several months ago, when I was unable to remove the clutch plate. It was supposed to just slide right off the shaft with minimal effort, but hadn't budged since bell-bottoms were in style. My buddy Noah was over to help and hang out, so between the three of us, we were eventually able to come up with a suitably dangerous solution to the problem. Turns out that all it took was grinding down two of the adapters for the slide hammer, holding a torch on the hub until it released the requisite noxious fumes, a little cursing, a lot of hammering, and we were home! After that is was practically no effort at all to open the drive chain housing, and remove the drive gears and sprocket. By this point we were all pretty pleased with the weekend's progress and didn't want to push our luck.